I seem to have a slight addiction to page-a-day calendars, calendars in general, and of being surrounded by beauty–beauty in the way that this eye beholds it, anyway. And so, I found myself on Amazon, searching for yet another calendar, even though I had already purchased two at a discount. I am happy with both, but I needed something more. I needed something visually beautiful to greet me every morning at my work space. I decided to go with the flowers again. A flower a day that could be in the form of a bouquet, a single close up, or flowering plants in their natural element. While I was at it, I came across a wall calendar of glass art (I needed another to compliment the one I already have). I recognized this stunning art. 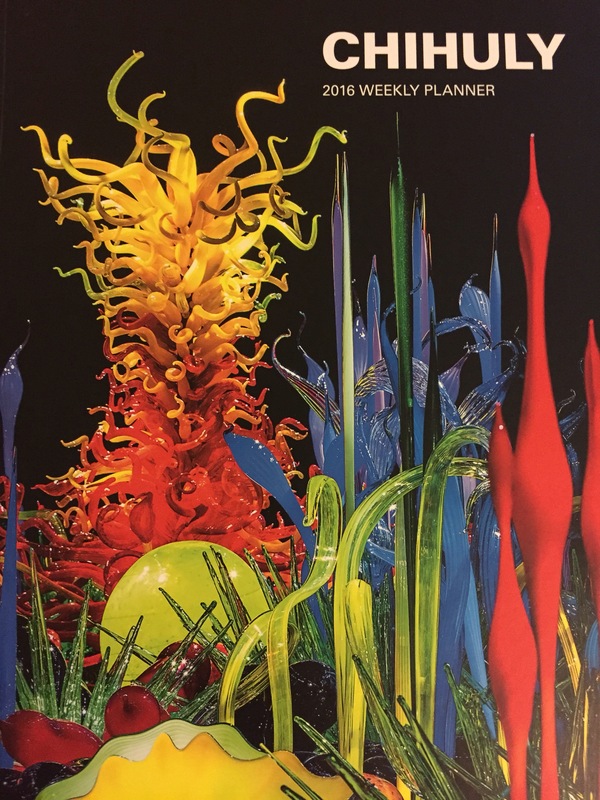 The name looked familiar: CHIHULY. And then I was taken back to our visit to Las Vegas this past October and being inside the Bellagio Hotel and Casino to look at the autumn botanical garden display. 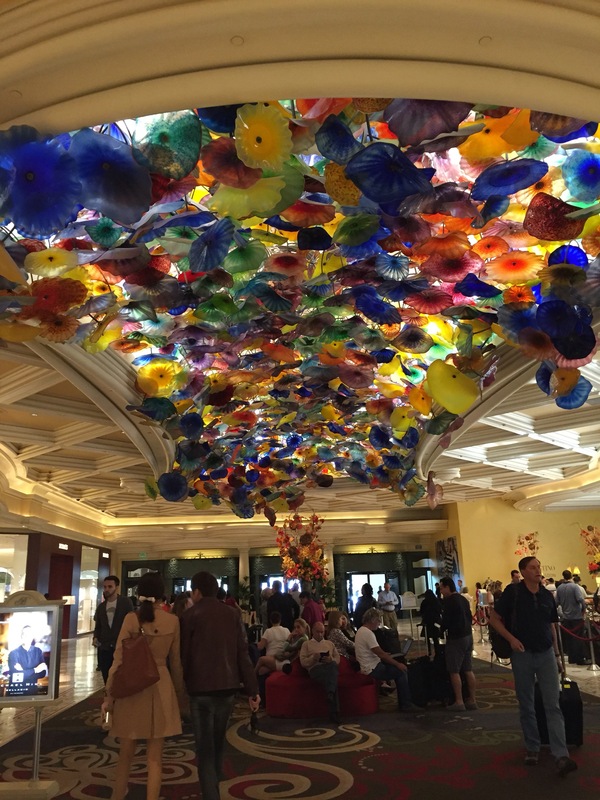 When we walked into the lobby, we were greeted with the beautiful creation of Chihuly’s glass art. The interaction of the vibrant colors, shapes, and light was magnificent. Amazon kindly brought to my attention that I might like to also purchase the Chihuly 2016 weekly planner. I usually pass on these temptations, then I thought about how nice it would be to see a different work of his art up close every week, and I also thought maybe I can use the weekly calendar to write a little something each day, a mini journal of my thoughts to highlight the day. It would force me to get to the page and re-develop a routine, keep the fire going–and it’s been great. I’ve only had the calendar a few days, but every morning that I see the calendar, I’m drawn into the pages by the pure beauty of its cover; somehow, it makes me want to reach for my pen and such an un-intimidating amount of space for each day; there are no excuses. I love it and am happy with all of my new calendars; although, I do admit, that I may buy just one more page-a-day calendar to satisfy my funny bone. Both photos snapped using my iPhone. It’s not often I’m up this late. In my mind it’s still yesterday and not already today. I have felt hungry most of the day, and I could not stand it any longer, I gave into the pancake craving and whipped some up. I use the boxed mix: just add water and a little love, a pat of butter, syrup–a perfect way to find comfort and satisfy the craving for something warm and sweet. I finally realized the trick to a perfect first pancake a few weeks ago. Very little oil on the pan, barley there. 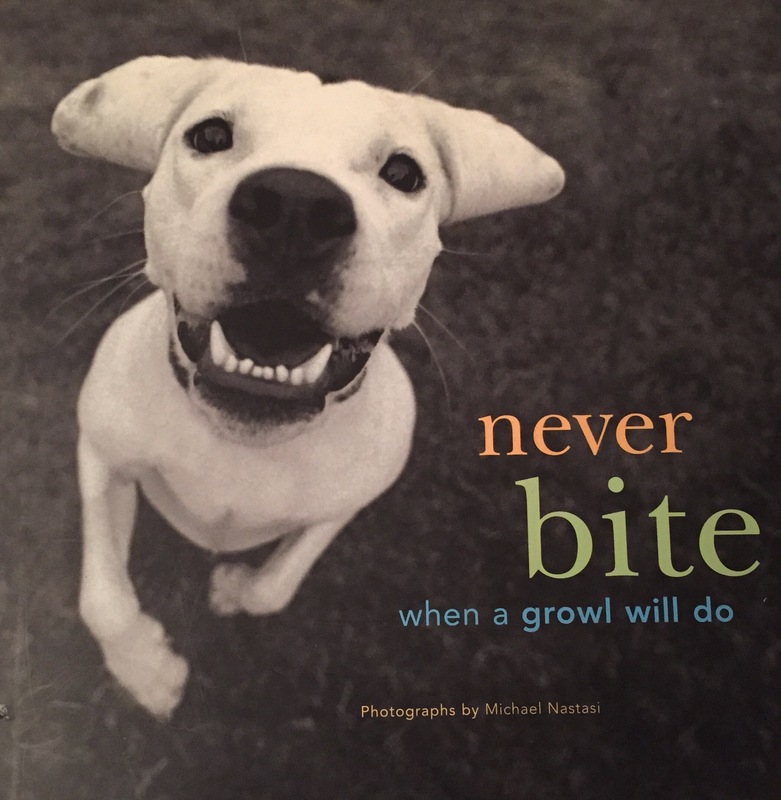 This morning, when I was down near the lower shelf where the books are, I saw the book that always makes me smile: Never Bite When a Growl Will Do, Photographs by Michael Nastasi. I thought, I should take this into my co-worker and show him since he’s a dog lover. 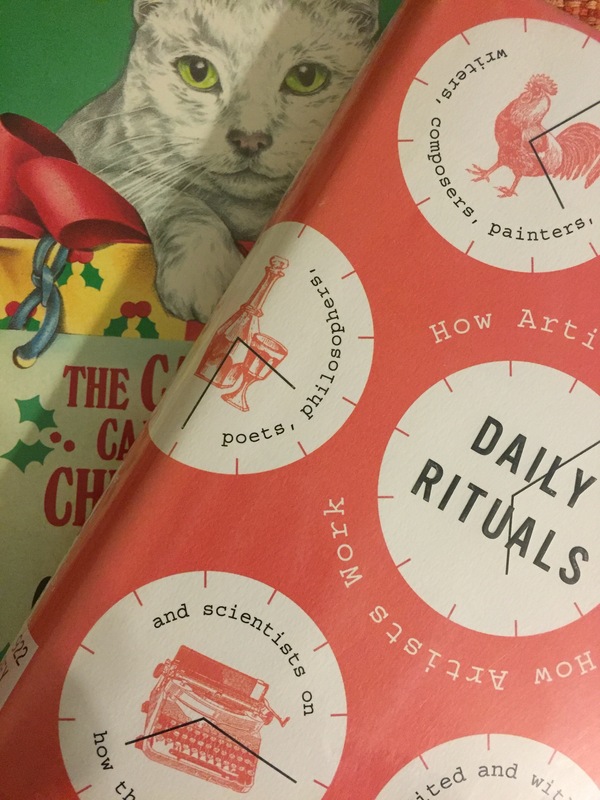 I packed the book into my bag and set off to start the day. Once settled in, I went into his office and told him that I had something to show him that would surely bring smiles. He sounded less chipper than usual and said he was having a bad day with bad news. “What happened?” I asked. He went on to tell me of some things that were going on. When he was done, he asked what it was I had. I showed him the book and said I thought he’d enjoy it and to take his time, no rush. As small as this gesture was, I was happy to bring a little brightness to the day by sharing. He ended up ordering his own copy on Amazon. Never Bite When a Growl Will Do will especially be appreciated by anyone that had or has a canine in their life. The quotes that accompany the wonderfully captured photos are a perfect compliment. Last night I searched the internet for quiche recipes looking for something meatless. I was pleasantly surprised at how this one turned out. I used a pre-made, frozen pie crust. There used to be choices; this time, my only choice was a Marie Callender’s two pack in a tin. Lack of choice, in this case, worked out really well for me. 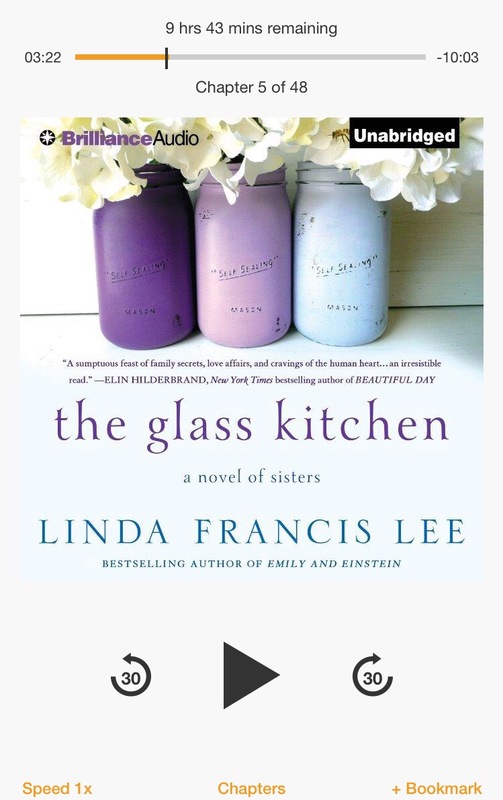 Before I got started, on went the wireless headphones, and I continued listening to my audio book, which I have been enjoying so much, I cleaned all the dishes (I’ve been bad about this lately), and I cleaned a pile of papers that have been sitting on the floor waiting. I was surprised to see that in the past few days, with cooking and cleaning, I am already halfway through this 11 hour audio. When I started preparing the meal, I realized that I had forgotten the zucchini. Darn. I didn’t use the tomatoes, added extra mushrooms. Passed on the curry powder and used only cheddar cheese. I added some of the cheddar cheese to the eggs, then added a generous amount to the top before baking. Since I was using two pie plates, I ended up not having enough egg mixture, so I beat 4 more eggs together and added a splash of milk. I was very happy with the end result. I made a couple of quiches before, but this one had the right amount of egg and milk, so that the custard was not runny. 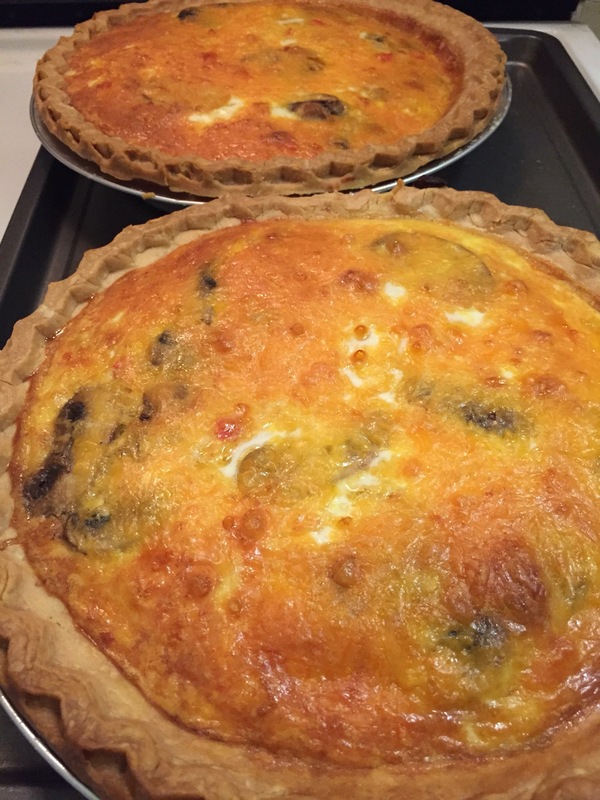 Tomorrow, hubby and I will find out how the quiche does for lunch leftovers. I’m getting hungry thinking about it and hope it’s just as tasty! I don’t want to jinx myself, but I feel like I’m getting my cooking groove back. It’s slow, but there is progress. Late this morning I parboiled a large potato, shredded a zucchini, and chopped up some green onion. 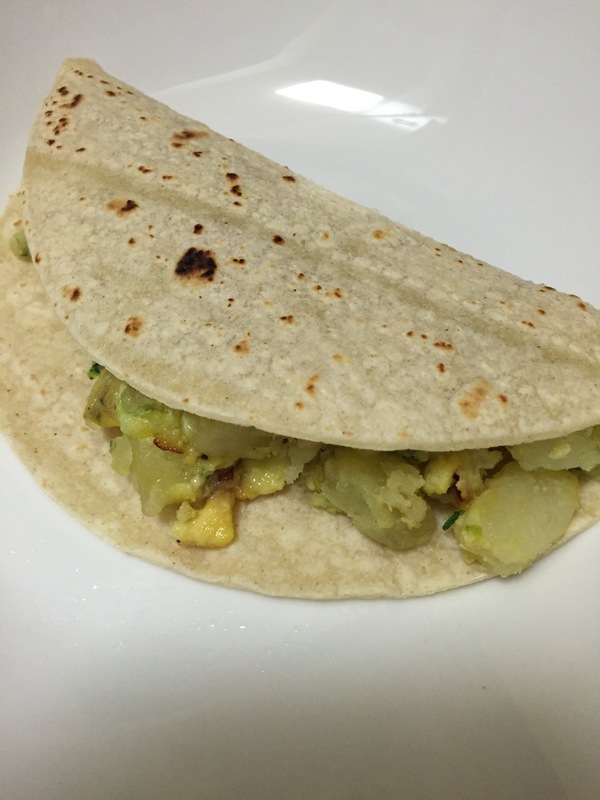 I cooked this in some oil until the potatoes started to brown, added salt, garlic salt, pepper, a dab of butter, then beat six eggs because that’s what I had left, heated the tortillas and voila. I love zucchini, yet I wouldn’t have considered preparing it this way if not for my mother-in-law. She said that she read somewhere that Alfred Hitchcock liked shredded zucchini cooked with a little butter–something like that; she thought that sounded good and loves zucchini too, so tried an egg variation. I did a quick search about this tidbit; couldn’t find anything. She would have learned about it long ago. Well, the story and association stuck with me. Breakfast was simple and delicious. The great thing about tacos is that the variations are endless. Yesterday I spent the whole day reading. It was a delight. It felt good to have the day free without the interruptions of a regular day. School begins again on Monday. I’ll only be taking one class, but I know that because that will be my focus, pleasure reading or any kind of reading will have to slow down again. I’ve gotten on a bit of a YA steak lately. I listened to an audio: Counting by 7’s by Holly Goldberg. It was an enjoyable story with quirky characters, particularly Willow Chance, who is also highly intelligent, and a foster child whose parents have died; she is left with an odd set of circumstances and people that help her put her life back together. While I was reading an issue of Bookmarks magazine, I learned of a movie that will be coming to theaters soon. It’s based on the book by Katherine Paterson called The Great Gilly Hopkins. I know that I want to see the movie, and in this case, I wanted to read the book first. I was glad to be introduced to this book that is meant for the middle-school reader. I couldn’t put the book down. It was a quick read. Gilly Hopkins has been in and out of the foster care system; she is feisty and sometimes a downright mean young lady. The ending is bitter-sweet. I can’t wait to see how the movie version of this book plays out. I was in the mood for something by Kate DiCamillo, so I chose The Tiger Rising. This was a beautiful short piece about a boy, a girl, a tiger–a story about love and acceptance. It touched my heart. And the book that I spent yesterday reading was A Step Toward Falling by Cammie McGovern. There are a handful of quotes of praise on the back cover of this book and I would say that one stands out and made me want to start reading it: “This is a book to read, savor, and pass on and on until it has gone around the world twice.” –Ron Koertge, author of Stoner & Spaz. A Step Toward Falling is worth the time. For non-YA fiction, I am pecking away at Neil Gaiman’s: Tirgger Warning: Short Fictions and Disturbances. I love that in the introduction he gives a short bit about how each story came about. I am enjoying the stories so far. I also finished The Impossible Lives of Greta Wells by Andrew Sean Greer. I’m not usually drawn to time travel novels, but for some reason on the day I was browsing the library bookshelves, this one caught my attention. I enjoyed every page of this story that was split between three periods of time in New York. I could not put it down. I continue to find new books to add to my list. I recently broke down and purchased the Kindle Paperwhite to add to my collection of Kindles. I now have three and each serves its purpose. The Paperwhite has made it much faster to search for books both in the Kindle Store and in my own collection; and now it’s much easier to read where there is low light. It’s also refreshing to be able to see the book covers. I have accumulated far too many books on my second Kindle and was feeling overwhelmed and not being able to get to them all. I’m trying not to clutter this Kindle with too much at one time. Here we are in 2016, and even though it will take me a long time to finish it because of other things, I have begun reading The Old Curiosity Shop by Charles Dickens. It is so easy to get lost in his beautiful language and story telling. The way that he creates images that stick in my mind never ceases to amaze me.